Last weekend I was up at the crack of dawn and not, for once, due to my usual little alarm clock – the one that goes “Mummy Mummy Mummy” increasingly loudly and has no snooze button. I’ll let you into a little secret for a minute here, to set the scene a little bit: I’m actually a really lazy cow. I’m lazy, I’m quite antisocial, and if eye-rolling burnt calories then I wouldn’t ever have to wear plus size clothing. So anyone who knows and loves me might have raised an eyebrow (or laughed out loud) at the prospect of me getting up early of my own volition, being energetic for longer than it takes to run upstairs and grab some emergency baby wipes, and to be greeted by FREE HUGS upon arrival at a tent full of free spirits. But that’s exactly what happened and I loved every bloody second of it. I’d actually wanted to go to one of the (even earlier) midweek morning sessions in Liverpool with Primo many months ago, because I knew it was a family friendly event and I thought it would be something different to try. But one thing and another, I never got round to it (story of my life, that). 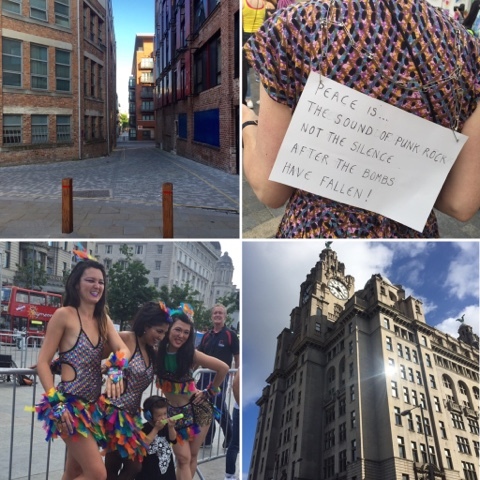 So when I saw that the lovely folks from MGV Liverpool were holding a special morning rave as part of the Liverpool Loves festival – and what’s more, that they were taking a break over the summer and this might be my last chance for a while – I knew I had to finally make the effort. Do you know what? I can’t remember the last time I had such a fab Saturday morning. I’m pretty sure that as a mother I’m meant to say that “every day with my little prince is a treasure” but a change is as good as a rest and it felt wonderful being out and about on a fresh new day with no change bag, no raisins, no small cardboard books and little cars – just some sweaty pound notes and my sunglasses. Oh, and my friend’s Cath Kidston water bottle – just in case I forgot I was somebody’s mum. 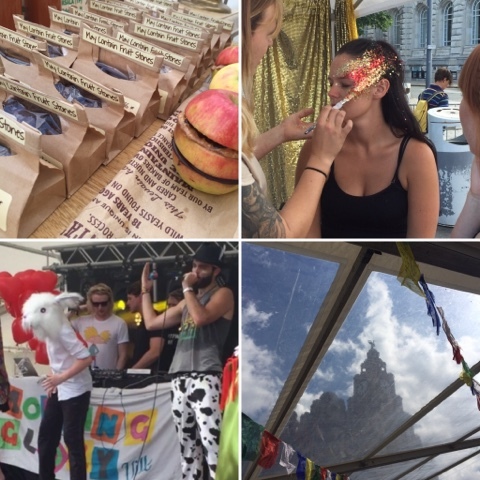 There was a healthy food and juice bar, a massage corner, hand treatments from Lush, bubble blowing and glitter aplenty. The DJs were churning out banger after banger, and there was a kid wearing a giant rabbit’s head throwing shapes on stage. In fact, there were kids everywhere. Fairy wings, face paint, ear defenders…I started to feel ever so guilty for not bringing Primo but if I’m honest, he’s not mad about loud noises and I know he can hear me speak perfectly clearly even with his ear defenders on so I’m not sure he would have enjoyed getting his groove on next to the speakers waiting for the beat to drop with mummy. Outside the marquee was street food heaven: perfect crêpes, to-die-for vegan samosas, boozy slushies, humongous slices of watermelon. If I wasn’t marinating in my own sweat and completely goosed from dancing, I could have spent the whole day there in the sunshine. There was live music on several stages as part of the other Liverpool Loves events, a fab stand where you could have your face glittered, and loads of arts and crafts for sale (my faves were from Myne Boutique who have loads of lovely gifts including all things Scouse). The daytime festival goers were out in full force by lunchtime and wondering who we were, all these people with glowing faces wearing animal print trainers, doc martens, flower garlands and tutus. Or in my case, head to toe in self satisfaction and feeling part of something special. I left feeling knackered but happy. Not just happy: energised and revitalised…mentally anyway. The next day I felt like I’d run a marathon and had caught the sun leaving interesting patterns where the neon body paint had been. If I did this every weekend, I think I might just be the happiest person alive.